As Valentine’s Day approaches, sentimental remembrances dominate the shelves, and dealers entice with chocolates, jewels, and lingerie. 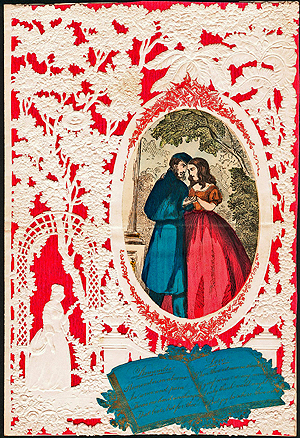 While modern cards bear little resemblance to the paper confections of long ago, the concept survives, bearing visions of romantic love and blissful marriage. Collectors of valentines and the related memorabilia, however, celebrate their holiday every day, researching and sharing their passion. Displays and articles have brought long-cherished love tokens to new audiences, where they are being appreciated with respect and fascination. 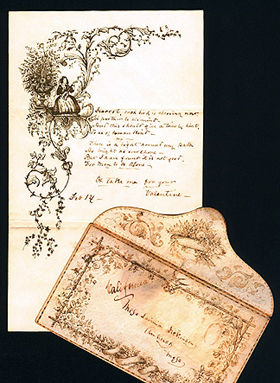 Valentine love letter sent from California Gold Rush era to Lavinia Dickinson, Amherst, Massachusetts -- the sister of Emily Dickinson. Messages of love span the centuries, and are interwoven with culture and history to create a very poignant view of actual people and their sentimental values. They enable us to acquire a unique concept of love and romance in a different historic period, and create an interesting chronicle of a significant social event which was celebrated extensively by every strata of society. Many of these love tokens were given throughout the year, as simple tributes of love and affection. Found in England, but probably American. Watercolor on paper. A magical folding technique enables this to be folded into a secure packet -- once opened, it is difficult to reassemble. The folds are numbered, and as opened, gradually reveal separate images and poems. The prize at the center is often a romantic image or poem, and perhaps -- a special memento such as a ring or a lock of hair. 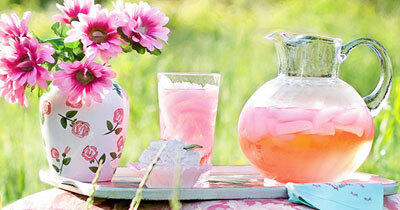 Within this category, there is something of special interest for everyone, as Valentines are far from limiting. The preservation of sentimentality, love, artistry, elegance, and accompanying history, make it an incomparable subject. Beyond the sugary open-outs, there is a wealth of beautiful material that is largely unknown. The subject permeated literature stimulated artists and passionately encouraged the creation of lasting treasures. They provide numerous areas for cross collecting, for the addition of these seemingly disparate items may actually enhance a collection. Impressive items appear on the market with surprising frequency, so even the rarest examples are not impossible to find. Woven hearts & hand with endless knot of hair: An example of an amazing handmade treasure, c.1850. 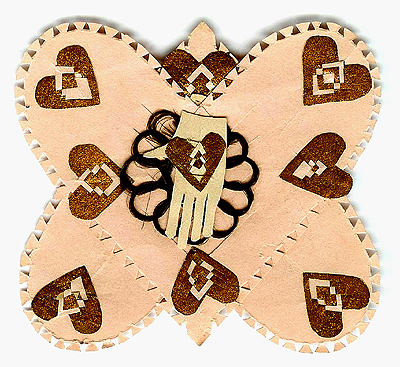 Two delicate pink paper hearts are woven together, and then, eight tiny gold paper hearts are woven into the corners. In the center of that treasure, a tiny woven paper heart and hand sit atop a carefully woven, endless knot of love. Tenderly coiled lock of the owners’ hair – its romantic significance could hardly be lost by the recipient! 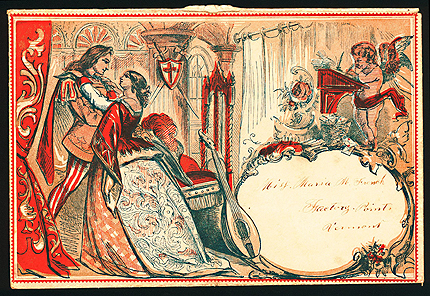 Valentine production was affected by a timeline of events, such as wars, the Industrial Revolution, changes in the postal system, and politics; enabling one to focus on a specific area of interest. A relatively inexpensive assortment can provide infinite rewards, while a sophisticated collection, requiring more dedication, may provide far-reaching potential for real research and investment. Both satisfy that genetic inclination to shop the shows, savor the camaraderie of the collecting atmosphere, and enrich one’s life! Research into early texts provides interesting insights into the history of Valentine’s Day. For example, the earliest piece in my collection is a page from the Nuremburg Chronicle, printed in Latin in 1493, providing the first reference to the martyrdom of Valentinus; the first reference to the pairing of birds on Saint Volontyne’s Day appears even earlier in Geoffrey Chaucer’s Parliament of Fowles. In the seventeenth century, Samuel Pepys recorded in his Diary, that jewelry, gloves, and a paper valentine were gifts on Saint Valentine’s morning, along with the promise of a person as a Valentine for the coming year. Until that time, the Valentine had been the person chosen by lottery. Valentine writers, early chapbooks that provided poetry for suitors lacking the talent to create original romantic verses, provide a curious perspective of people – so similar to us – who enthusiastically participated in the annual festival. 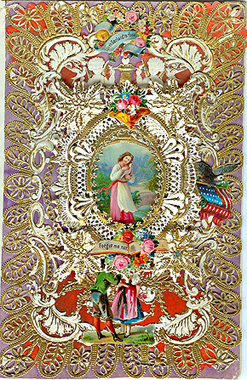 From the late fifteenth to the mid-nineteenth century, small papercuts known as Devotionals were created for the joy of the artists’ religious faith. From convents in French and German-speaking areas, there emanated beautifully executed works of art, which are still cherished today for their exquisite designs and their incredible delicacy. 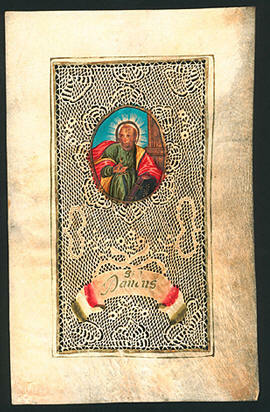 Vellum was delicately knife-cut, the artistry emulating the finest tatted lace, and often adorned with gouache miniatures of saints. Commemorating a wedding, baptism, birth, memorial, or Valentine, one might have been cherished within the pages of a family Bible or album – only to be discovered centuries later by an ardent collector. Following the elusive “evolution of the Valentine” has been a fascinating journey, and a revelation to discover the breadth of the subject, as well as the depth of the passion involved. In this instance, the passion was a religious fervor, and the resulting creations were sold for the purpose of charity. This was a sacred love token – as pure as the basic concept of love. Their unique form and beauty make them a significant link in the development of the Valentine, and help us to understand their important role in the intimate personal communication between friends and lovers so many years ago. Later cutwork is more familiar to us, with their generally secular themes. Created as tender gifts reflecting immigrant customs, or by parlour craft projects fashioned by sophisticated romantics, they are coveted by collectors, and may reach astounding prices. Cobweb: Hand-colored lithograph on Burke embossed cameo lace paper. England, circa 1840s. 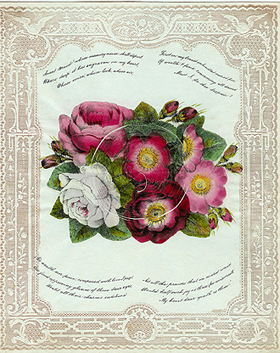 8” x 10” The delicate silk thread is gently lifted from its bed of roses to reveal a superb cutwork cobweb containing a painted image and a message. A secret token -- a lock of hair or even a ring, might be secreted within its’ web. The moss rose signifies “superior merit” -- as would be expected of the recipient of such a valuable treasure! Manufacturers of early paper were inspired by the designs, and the motifs, along with the Sacred Heart, endured during the evolution from handmade to manufactured. 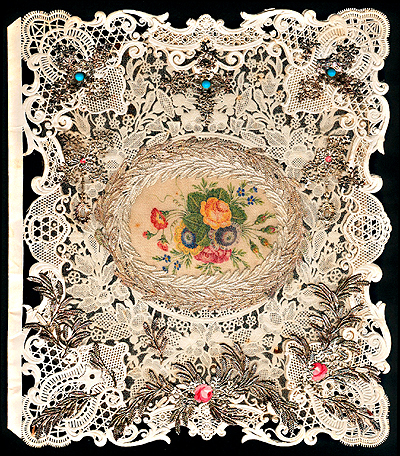 As the precursor of the magnificent machine-made lace paper marvels, these hand-cut designs are notable landmarks to a modern collection, and are still occasionally available. 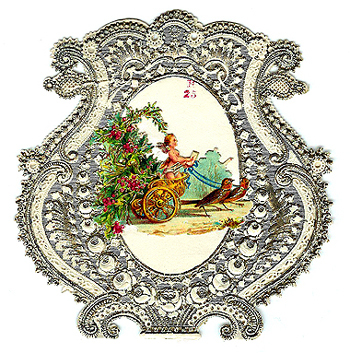 The fine early paper artisans resided in Austria and Germany, where cards became traditional ways to honor the New Year, Friendship, and Name Day occasions. During the later eighteenth century, as they became more sophisticated, they acquired elegant cameo-embossed, satin-covered surfaces, and often incorporated tempting secret panels and hidden messages. 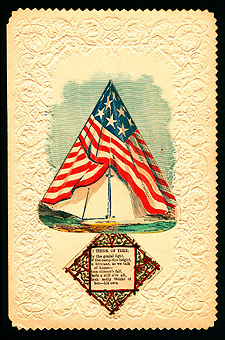 Mechanical cards were a popular invention, and cobwebs and open-work lace paper were not unknown. The Biedermeier Period, circa 1820, recognized for elegance in furniture and design, also stimulated the creation of some of the most elegant greetings ever seen. Tiny hand-painted and embossed paper ornaments, gilded die-cuts, or mother-of-pearl were affixed to silk chiffon, and framed with engraved messages, to create beautiful compositions. Unique and rare, the Fabergé-like treasures were among the finest examples available for the sentimental affluent. Today’s collector still seeks these paper jewels to crown their own collections. Open-work cameo embossing, English circa 1850: Often these were used to enclose small tissue-wrapped packets of perfumed cotton wadding -- creating a glorious sachet. The opening would have been embellished with a die-cut scrap or motto. 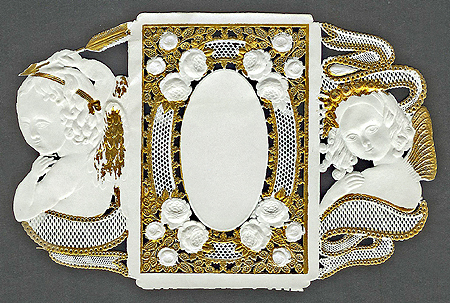 The manufacture of cameo-embossed lace paper reached its peak in England in the first half of the nineteenth century. Competitive companies applied rag pulp to steel plates, from which emerged cherubs, couples, the church (bastion of holy matrimony and wedded bliss), romantic imagery inspired by mythology, poetry and nature, and borders reminiscent of handmade lace. The beauty of the assembled collages – confections that incorporated lace paper, metallic Dresden ornaments, ribbons and flowers – proved irresistible. Engravings and hand-colored lithographs, both sentimental and satirical, puzzles and poetry, all added to the comprehensive offerings, based on price, style, and theme. Used as a canvas for elegant calligraphic script, these papers remain the pinnacle of manufactured stationery, and were essential to the refined art of letter writing. Accompanied by elegant pens and love letter seals, they created the elegant correspondence, which defined an era. 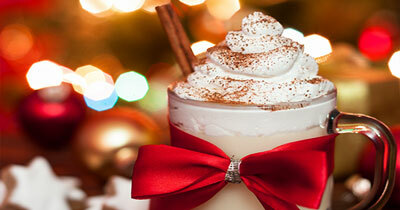 Long associated with the exchange of Valentines, is the delicious ingredient of mystery. Recipients were challenged to discover the identity of anonymous admirers, as mysteriously unsigned missives might be slipped under the door, tied to the doorknob, delivered by the postman, as well as transported by courier, coach, or rail. The tradition was an important aspect of nineteenth century life, where romance and death were regularly feted in albums, poetry, and art. The holiday was so widely celebrated that by the 1830s, it is said that 60,000 valentines passed through the London post office. 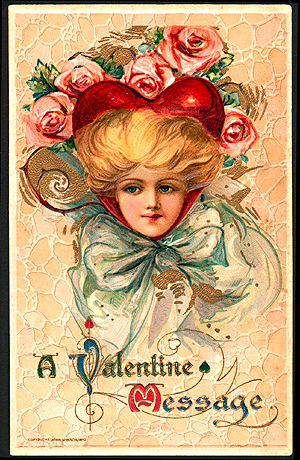 By 1857, three million valentines were sold in New York City, the number reaching nearly a billion, by 2002. 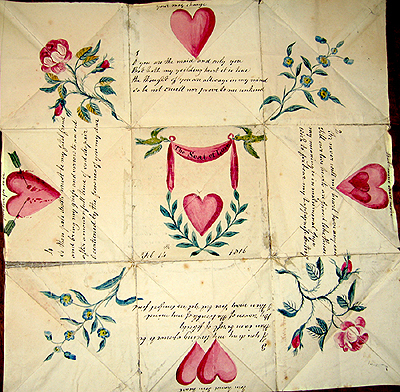 The earliest American valentines were handmade and are now coveted as folk art. 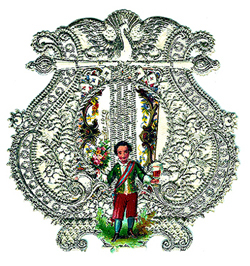 Cut paper, known as scherenschnitte, and fraktur liebesbriefe, or love letters, reflect the influence of the German immigrants. School girl drawings, theorems, cut paper, and shell baskets are examples of classic expressions of love learned from school or contemporary publications. The Language of Flowers provided an important tool, as hearts and flowers remained the eternal emblems of love. 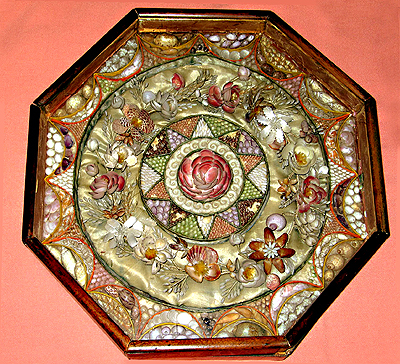 Octagonal boxes containing ornate shell compositions, generally made in the Bahamas, and scrimshaw love tokens such as busks, boxes, and pie crimpers are other expressions of love, which would be enjoyed by collectors of nautical items. The overlap is apparent, and thus the increased interest and value of many of these highly sought antiques. They belong in the hands of any appreciative collector who understands their relevance, and will cherish them. 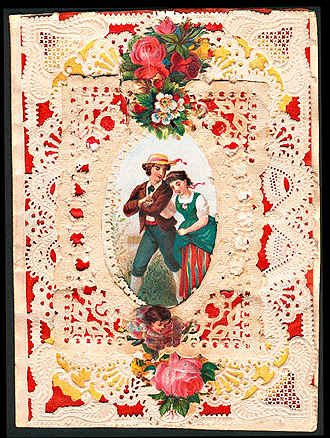 Typical small Esther Howland Valentines utilized the glazed paper wafers, hinges, and lace paper, and varied according to price. 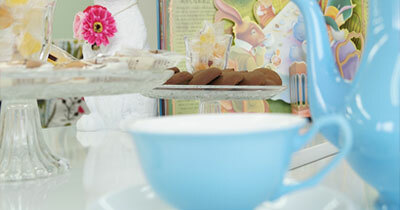 Esther Howland was a visionary who had a lasting impact upon Valentine history. While she was not the first to create Valentines in America, she is credited with having popularized the lace valentine, and propelling it into a major industry. Using a truly innovative concept, she recruited friends and established her now-famous all-female production line. Additionally, she initiated a cottage industry. Supplies, including a template, would be delivered by her coachmen to ladies in the vicinity, made to her specifications, and collected a few days later. The wondrous creations – with multiple layers, die-cuts, Baxter prints, Dresden ornamentation, and personal mottos inside – would then be sold throughout the country. 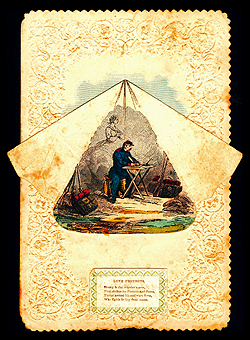 Starting with Leap Year cards she created for her friends at the Mount Holyoke Female Seminary in 1848, a business was established which yielded more than $100,000 annually. Specific markings identify these to the collector, and are keenly sought. 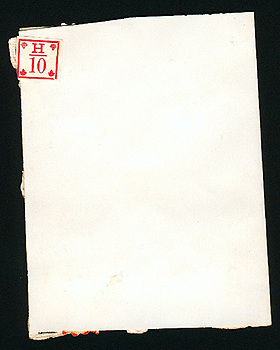 A paper sticker with a red “H-10”. The number refers to the price, “ten cents.” I have found labels, printed or stickers, ranging from ten cents to two dollars. The large extravaganzas are said to have cost $30 to $50 at that time! One could have purchased a horse and carriage for the price of one of her Valentines! While other manufacturers competed for the affection of the public, none could compete with the quality, taste, and style of Esther Howland. Designing and creating these memorable missives required artistry and inspiration, as well as a touch of magic. 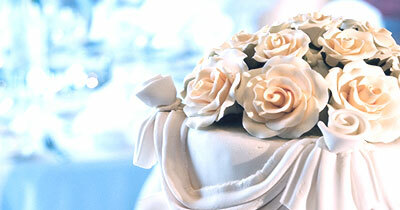 The finished products evoked fantasy and romance, and set a trend for more than thirty years. 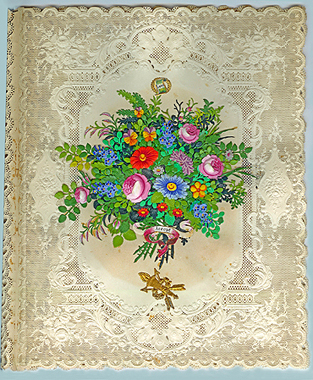 This is the classic bouquet that has been attributed to Esther Howland; the built-up collage of heavily embossed and painted flowers is applied to delicate lace paper, and would have been part of a multi-layered confection. None of these have been found with her label or marks, so it is not possible to make a definite origin. Serious history buffs will discover fascinating Civil War material. Rare examples feature photographs of the soldiers in uniform, or letters describing the war scenes, further illustrating that these ephemeral treasures were often a vital connection to home and loved ones. They fortified the soldier to persevere – knowing there was a beloved person awaiting his return. “Dear Sister … I must stop riteing (sic) for this time for I must tend to my gard (sic) … Amos Winner. 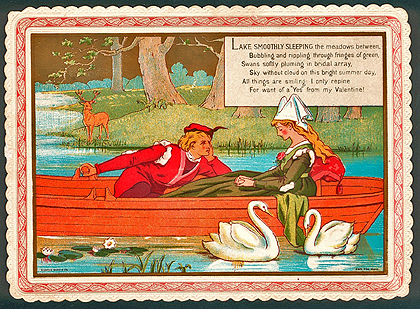 Valentine by Kate Greenaway: England, circa 1870. Design from an illustration for the book, Melcomb Manor, a Family Chronicle. Printed by Marcus Ward, London,1875. 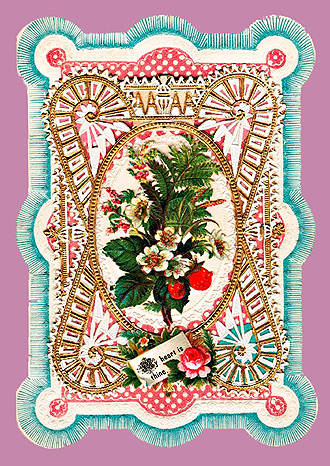 Sailor’s Valentine:	This exquisite example of an early Sailor’s Valentine is unique because of the raised floral wreath, dating it circa 1830. There is a similar one in the Victoria and Albert Museum, London, a gift of Queen Mary. The large octagonal frame is mahogany, rather than the usual cedar, with an ivory escutcheon. The central wreath, mounted en tremblant, rests on a raised silk base, and may even have been a wedding hairpiece. While artists influenced the designs of many pieces, unskilled, loving hands inspired and created my most sentimental treasures. Purity and simplicity are their most appealing aspects, as they are a personal connection to intimate links with the past. Wherever I look, I find valentines and related memorabilia. From my treasured Sailors Farewell pitchers, and the textile sailors’ bundles on the walls, to Elizabeth Cobbold’s majestic papercuts, or a Pennsylvania fraktur, I celebrate Valentine’s Day every day! Treasures such as a lock of hair woven into an endless knot of love, romantic games, watch papers, and fans – possessing their own language – enchant, as not all Valentines are paper lace. Even the related advertising materials have their vital niche. These intensely personal and wonderful mementos demonstrate the relevance of expressions of love throughout history, how they have permeated art and life, and passionately celebrate the tradition of The Valentine. Winsch postcard - Design by Samuel L. Schmucker, and printed by the Winsch Publishing Company in 1910. Postcards became the natural evolution of the Valentine as the Industrial Revolution changed the styles in paper tokens of affection.